Before I start with the interview, tell us – how are you doing these days? Recently, we released a new album and supported it with several concerts. Now we are planning some performances for 2014 and are getting ready to compose new songs. 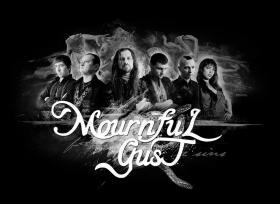 Many of our readers might not know much about MOURNFUL GUST – please tell us a bit about you. 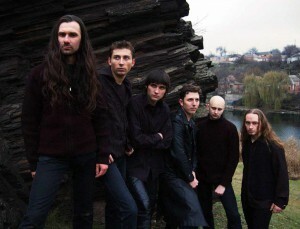 We are a band from Ukraine, former in 1999. During these years, we released 3 albums, a single and a compilation. We’ve also shooted 2 video clips and played several tenths of concerts. Actually, we are not so popular and do not observe an abundant support throughout the world. 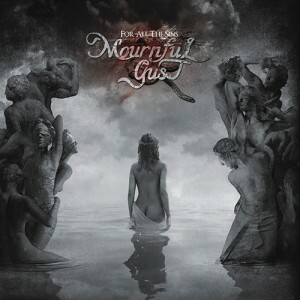 Mournful Gust play for those, who are alone and who enjoy emotional doom/death metal. Actual line-up consists of several experienced musicians. Are the relations between members good? Are you interested in live playing? Across the whole Mournful Gust history, we had lots of line-up changes, which hindered us from being more productive regarding gigs and greater amount of studio recordings. We’ve always had good relationships among band members, and they’ve been leaving the band entirely because of music considerations, nothing personal and no offences behind. And, of course, we are very interested in strong gigs, but, as I said, for a long period of time, we didn’t have opportunities to get on stage more often, because of line-up instability. At the moment, our ‘crew’ is steady and we are ready to perform on lots of stages to gift our music to you. How would you describe your new album? In which aspects do you think that it is superior and if there are some parts, which are dropping behind? We are very satisfied with our new creation, thanks to which we already have an idea, where to move further. I wouldn’t divulge strengths and weaknesses of our new album, but I’d say that we managed to achieve what we wanted. I guess that we’ve got enough inspiration and new impressions for new songs. What‘s the concept of „For All The Sins“? Otherwise, the topic of your album? I was thinking about what bind together all of your songs.Textually, though musically as well, “For All The Sins” doesn’t have any purposeful concept. Everything comes to the individual perception of all our listeners and ours. Each of us has his own sins and torments, and it’s like stained pages of life, put together. It is so intimately, that there’s just no need to impart any particular meaningfulness to our new album. What is more important to you? Visual interpretation of the music, or the lyrics? Could you describe what I should imagine with artwork for „For All The Sins“? The promotional work definitely belongs to the process or releasing the new album. How much time a day you’re willing to dedicate to promotion of your new album? I would definitely want more attention to “For All The Sins” and our previous discs. Paradoxically, we experienced incredible attention in the non-Internet times, when we didn’t have so many opportunities to spread information about our music widely. Now, in the digital era, the whole virtual ether is filled up to the limit. I catch myself thinking that people are simply not interested in listening to new music and find out something unusual. Lots of them still prefer listening to the band from 1980-s or 1990-s, than to albums released in the current year. As our second video went out — I published it several thousand times in one of the social networks. But this led only to some 7,000 views on YouTube and tenths of comments. Nowadays, it is very hard to conquer listeners or viewers. Nevertheless, it has to be done, if you want your creation to be noticed by more interested people. And this is what I spend the greatest part of time on, while I working on my PC. Is this type of doom metal your life-style? Style to which you gave your soul? Yes, brother, and this is what oppresses me and brings lots of negative into my life. I believe that power of words multiplied by music has an incredible property of materialization. Long time ago, I started to notice that each text to my songs is a peculiar scenario to some episodes of my life. Take any lyrics. I’ve already experienced or will be doing everything that I’ve ever wrote about. Believe me, I am now seriously thinking, what I am going to write about for the next album. I do not want a repeated self-hypnosis. But this is how I feel the music, which we play, and I just don’t have a right to turn off the road. May be some day my life enters the blissful period, when I stop composing such sad lyrics and destroying myself. For now, though, I haven’t disclosed such a mysterious formula inside of me. Time shows. 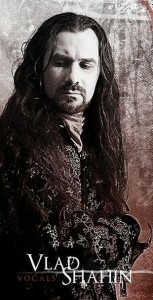 You have signed in Solitude productions, how is your cooperation going on? When it was born? We’ve been collaborating for already 7 years now, and, as I said before, we released 3 albums together. It all started in 2007, as we searched for a label for our second CD “The Frankness Eve”. That is when Solitude Productions offered the most suitable conditions for us at that period of time. Now they already have a significant amount of respected bands and albums in their catalogue, and, probably, it is the best place to realize doom metal and various bordering styles. My answer will be as obvious, as the question. Likely, it is the lack of money or a particularly low budget for bringing our creative ideas into life. I would also add abundance of the modern metal-scene to the list. If a person doesn’t have any direction in choosing music, it’ll be very hard to find a band, which will disturb his heart. But I guess, this is rather musician’s problem to find his listener. As for MOURNFUL GUST, the problem is that we are playing in a non-popular genre. We do not gather full clubs, because our name is not so popular. Doors for big festivals are closed for us, as we are an obvious non-format for an open-air. Please, do not take it as complains. We have this negative karma. May be this is our barrier? How is it with MOURNFUL GUST and live performances? Do you enjoy them or do you see them just a necessary evil to get your band a bit more into the spotlight? Any special memories that you would like to share? We like live performances and this is an integral part of our band’s activity. Do not pay attention to the fact that we played only several tenths of shows during one decade and a half — we had some objective reasons for that, which do not bring any happiness to any of us. Each our gig is a bothersome event, full of excitement and waiting. But this is worth moral and material resources. As for the second part of the question, we do not have better or worse concerts. They are all in our memories. Negative moments are forgotten and all the best is considered as it was meant to be. Nevertheless, I hope, that our best gigs are waiting for us and, probably, they’ll be in your country. What is it like to be a Metal musician in Ukraine? Are you in any way accepted as an artist or are you like a cultural outcast of some sorts? I am not an outcast, nor an artist. I am grateful to the time, in which I live: being a non-professional musician, I’ve got an opportunity to record my songs, release albums, perform, give interviews and be a part of such band, as Mournful Gust. And it has no matter, in which country I live. It doesn’t depend on geography or social issues. And now last question. Do you know something Czech metal bands? Yes, I am aware of some representatives of your scene, and the first ones whom I have to mark are such amazing bands as KRABATHOR (world-known) and SILENT STREAM OF GODLESS ELEGY, which I like very much. For a long time, I’ve known such legends as MALIGNANT TUMOUR, MANIAC BUTCHER, DARK STORM and, of course, MASTER’S HAMMER. You would probably be surprised to hear that I can mention such names as CARNAL DIAFRAGMA, PIGSTY or CEREBRAL TURBULENCY …you’ve got the best acts within grindcore and experimental music! Thank you for answering my questions – here is your chance to speak to the people of Czech repuplic! Any last words to the readers in Czech republic? Thank you very much for the questions and an opportunity for Mournful Gust to become a little bit more familiar in Czech Republic and among your readers. I hope that at least some of you like our albums and our band in general. And that some day, we’ll meet on our show!